At 42 and 43 Beacon St. the Somerset Club dominates its section of Beacon hill. Its double bays rise above the roof line, and a substantial rusticated wall in front of it sets a monumental tone. Though French in design, the cartouches on its bowed front and the strong roof line give it styling which fits with its federalist styled neighbors. Perhaps the most interesting element of the building is how it has been remade as the Beacon Hill neighborhood grew. 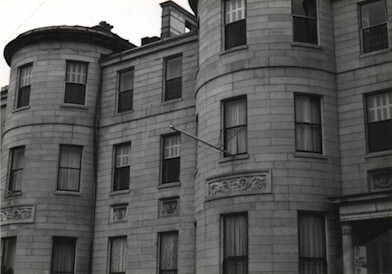 Originally the mansion of David Sears, this was a free standing building, with only the bay on the right, and a garden between it and the Otis estate by Charles Bulfinch at 45 Beacon St.
As land values skyrocketed through the 1820's, maintaining yards and separate structures on the hill become financially impractical. The Sears family doubled the home's size, establishing it as the most expensive dwelling in 1830's Boston. Merging these mansions was clearly not a consideration when they were constructed. The neighboring Otis House had a large oval salon facing the Sears House. When these buildings were connected, the Sears House had to be built around the Otis' curved side. In the 1860's Sears relocated to his country estate, the Longwood Cottage and Farm, in the exclusive Brookline enclave which he had developed. The Sears House underwent a final expansion after the Somerset Club took it over in 1872 and added the third floor which is seen here. This final addition completed the Sears House's transformation from being a distinctive granite mansion, to the fortress-like row-house seen here as the Somerset Club.